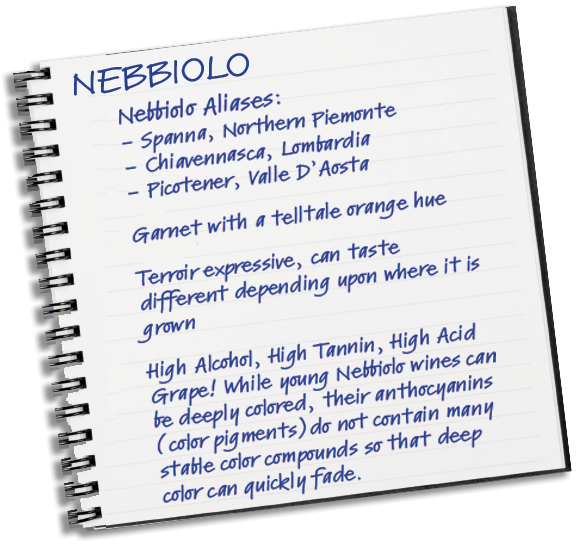 Nebbiolo takes its name from the Italian word nebbia, meaning fog, the cloudy appearance of the bloom on each grape and the tendency to grow in valleys such as Barolo and Valtellina where fog is a usual suspect. EXPRESSION: Expect a kinder offering of Nebbiolo from this DOC due to more fertile soils, lower altitude, or declassified fruit of young vines in DOCG vineyards. Even so, the wines will only be a small step away from the more highly regarded appellations. A hilly area north of the Tanaro river and the town of Alba known for well drained, sandy soils. EXPRESSION: In recent years Roero DOCG has begun to elevate its Nebbiolo wines to a level very near that of Barbaresco. Expect more friendly tannins and a more fruit driven style from Roero, however; friendly is relative with Nebbiolo. 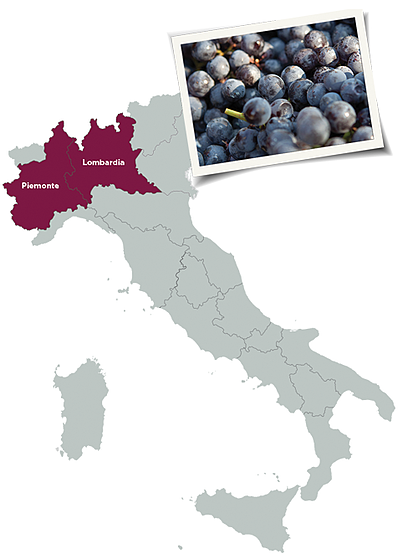 100% Nebbiolo grapes coming from the 3 communes, Barbaresco, Trieso, Neive, and parts of Alba south of the Tanaro River. EXPRESSION: Barbaresco DOCG, the more calcareous twin of Barolo DOCG, offers an elegant interpretation of Nebbiolo. Elegant, but not silky, offering fresh and dried red fruits, sage, and a savory nature which is very similar to Barolo. 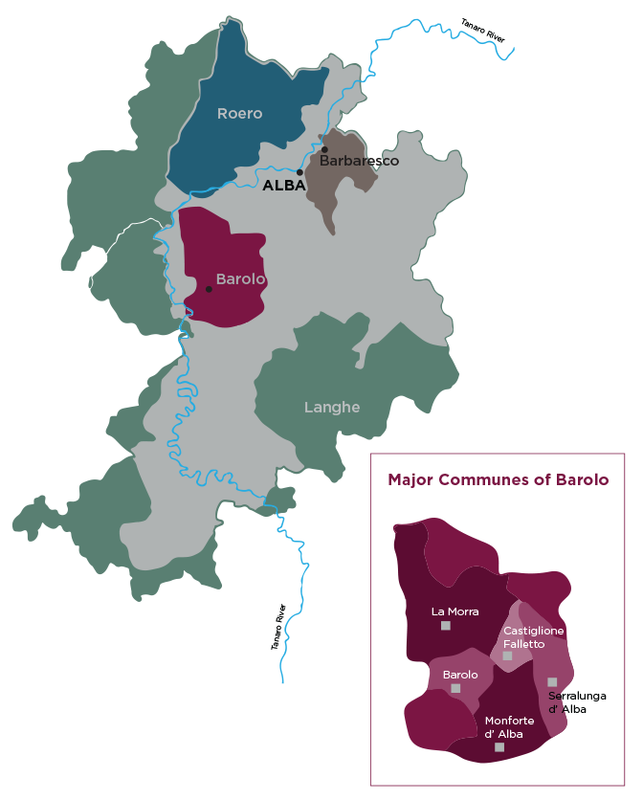 100% Nebbiolo coming from vineyards in the 11 communes of Barolo: All vineyards of Barolo, Castiglione Faletto and Serralunga d’Alba, and select vineyards of Novello, Monforte d’Alba, Diano d’Alba, Grinzane Cavour, Roddi, Verduno, Cherasco. EXPRESSION: Nebbiolo through the lens of Barolo DOCG is an intense experience. While each individual vineyard must be considered, the overall impression is a wine with a powerful structure, more savory herbs, flowers and earth than fruit, and an unexpected finesse in the finish. “Nebbiolo of the Alps” to receive direct sunlight throughout the day in this harsh terrain and high altitude terroir. The Valtellina is an east-west alpine valley with the Adda River at its center. Steep terraced vineyards line its slopes which make hand harvesting dangerous but necessary. EXPRESSION: The beauty of Valtellina is that we now see Chiavennasca (Nebbiolo) through the influence of altitude. The cool, alpine climate promotes the red, forest berry fruits and changes the tannins from gripping to kind. The Valtellina Superiore vinyeards and subzones unfold like a snake on the right bank of the Adda River with the town of Sondrio at its center. EXPRESSION: The top vineyard sites of alpine Valtellina soak up the sun and produce Nebbiolo of unexpected intensity. The Superiore and “Cru” wines are near the intensity of Barbaresco and offer the expected complexity of savory herbs, stony earth, and red berries. A wine generally produced outside of the major Subzones from Nebbiolo grapes dried for approximately three and a half months. EXPRESSION: Imagine Amarone, but instead of the soft generous Corvina, slide in the edgy, powerful Nebbiolo characteristics. Because the grapes are harvested and then dried, the wines offer dried berry characters alongside of raisin, savory herbs, and coffee/mocha. Make up the Sub-Zones of Valtellina Superiore. Each Sub-Zone is known for imparting particular characteristics.